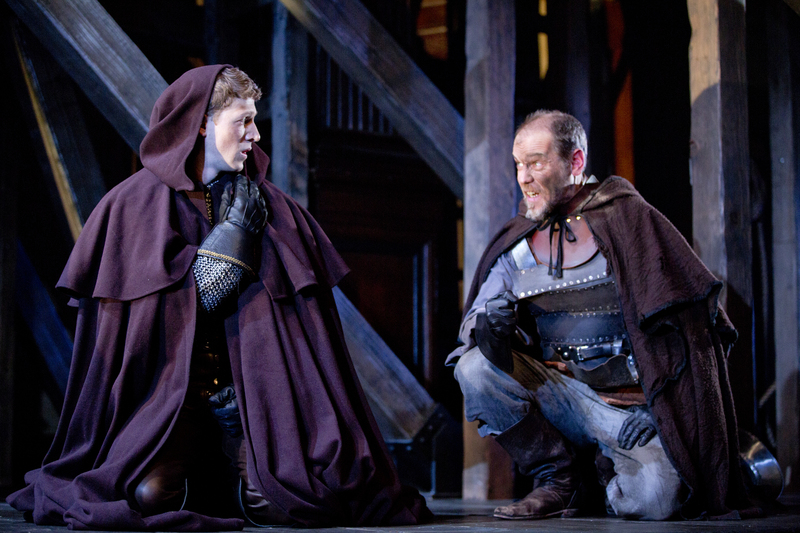 Zach Appelman (l) and Louis Butelli in Henry V. Photo by Scott Suchman. 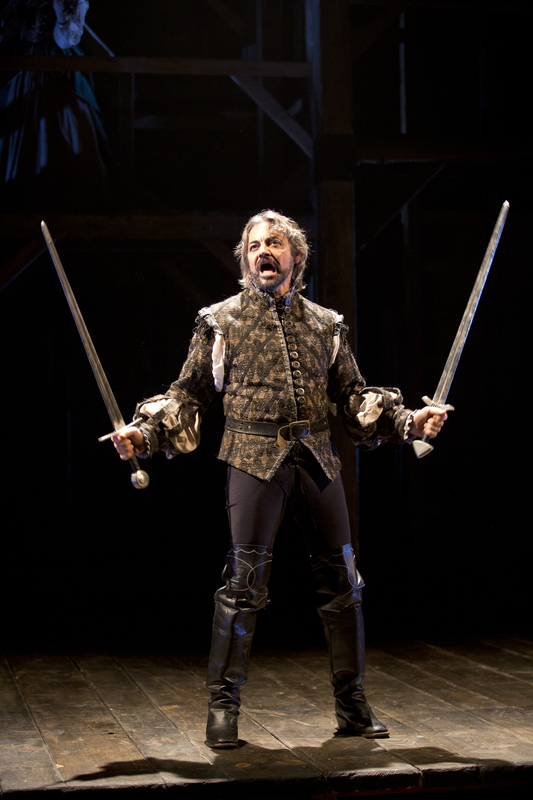 Hello again from your pal Louis Butelli, currently playing Bardolph (and others) in Henry V at the Folger Theatre. I do hope you’ve already booked your tickets, because there don’t seem to be many left to book. We’ve had a big, record-breaking audience, and we’re having an excellent time, which is very, very cool indeed. 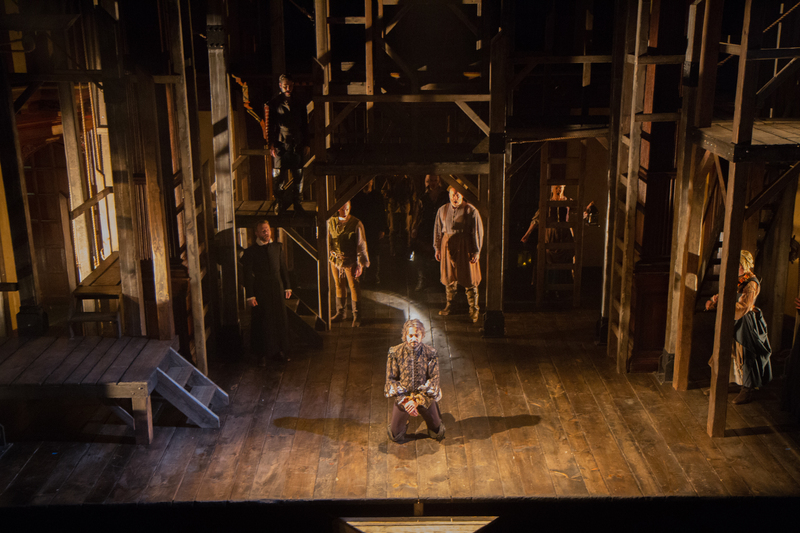 As such, Henry V has extended its run through March 10th. We’d love for you to come see us, so please click here for tickets! Which brings me to the topic of today’s post. 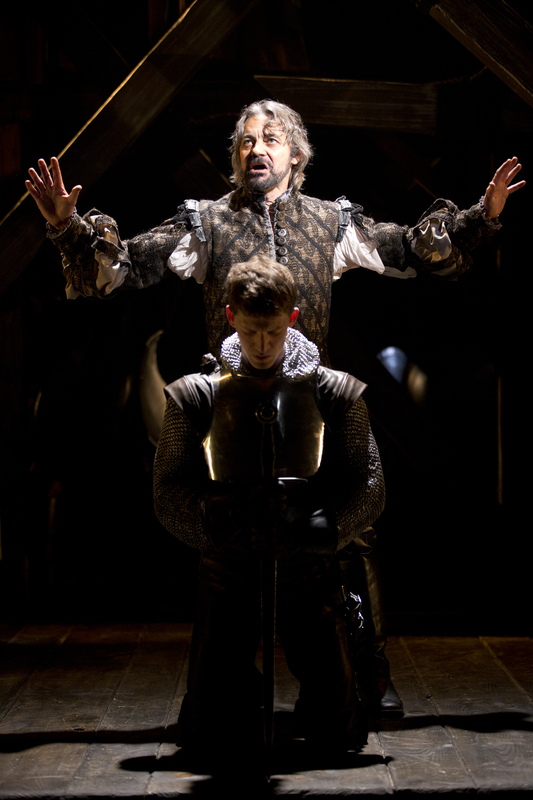 The incredible Richard Sheridan Willis, currently playing the role of “Chorus,” had another theatrical engagement lined up when he accepted Henry V, the dates of which conflict with our extension. Terrifyingly enough, this means that Richard is leaving us next week, and that another actor from within the company will need to shift and put on the very big shoes Richard leaves behind. Richard Sheridan Willis, who will sadly be leaving the cast of Henry V on March 3. Photo by Scott Suchman. Richard’s performance has been uniformly praised in the press (he “haunts the stage like a mournful ghost,” reads one evocative quote from the Washingtonian) and serves as a narrative linch-pin for our story. I ask you now to imagine the nervousness that might strike that poor actor’s heart that has to take on the task of stepping in for that guy. I ask you this because the job has fallen…to me. Yup! Beginning March 5th, I will be playing the role of the Chorus, and the very cool Dylan Myers will be taking over for me as Bardolph (and others) in Henry V.
I just have to take a second here to say what huge respect I have for the understudies of Henry V: Carol Spring, Doug Krehbel, Emily Joshi-Powell, Eva Wilhelm, Will Cooke, Ed Christian, and Chris Genebach – but most particularly for the heroics of Andrew Schwartz, Pomme Koch, and Dylan Myers, and stage management team Che Wernsman, Alicia Sells, and Jimmie Kramer, who all hit it out of the park during a particularly crazy week. Y’all are incredible. I can’t help but be a little nervous about taking on a different role in the show. We’ve been running since January 22 and Tuesday, 2/26 is our 40th show. The performances have all deepened, the relationships have been more fully fleshed out, and the show is truly a well-oiled machine. For a superstitious and ritualistic actor like myself (see here), even a small change in routine can leave me in something of a tizzy. For me, what is about to happen is a total seismic shift. New lines, new costume, new blocking, famous speeches, not to mention the deep sadness of leaving my own track, and the difficulty of missing Richard in the company – everything that could possibly change is about to change. Richard Sheridan Willis (center) at the opening of Henry V. Photo by Teresa Wood. LB: You spend so much of the evening in a sort of one-sided conversation with the audience. What is it like to talk to them? Do you find that you establish “relationships” with any of them? RSW: It’s always interesting to talk to each audience, because each audience is different. I try to gauge the mood of the audience as they come in, when I have those 10 minutes on stage before the show begins. Then, I try to focus their attention and bring them into the world of our play. I see that as my job to be a friendly conduit into the play and to guide them along in the story. As for establishing relationships, there have been times where I have sought out a person – usually a child – to say lines to. There have been times where I have tried to say a line to a person and they won’t look at me… and there have been those moments when I have talked directly to someone and they have smiled and nodded back to me. On the whole, I try and keep my relationship with the energy of the audience as a whole entity. I come in and out of the action with various speeches, but being on stage for a lot of the action, I feel that I can take the play forward in a way that suits that particular night’s audience. LB: What is the most difficult part of taking on a speech that Shakespeare fans believe to be famous? Richard Sheridan Willis stands above a praying Zach Appelman. Photo by Scott Suchman. LB: You and I have wondered about Shakespeare’s use of a “Chorus,” which is a rare thing. Romeo & Juliet has one, I think. Why do you think there is a Chorus in this play? LB: The Chorus is a major and fundamental part of the evolution of Western Drama (the Greeks, etc). How do you take such an iconographic part of theater history and turn it, like you do!, into a living, breathing person? RSW: As I said before, I use a large part of me and I transfer over to the audience. I open myself up to them. I try to convey the excitement of theatre to them, and I really try to communicate with them on a universal human level. I trust that I’m interesting enough in the way I look at them and appeal to them for them to listen. As you’ve said in terms of comedy, it’s all about making yourself vulnerable. That’s more interesting to an audience than being shouted at…although I certainly do that, too!!! And there you have it. Some words of wisdom from one Chorus to another. In any event, come along and see us. Richard plays the Chorus through March the 3rd, and then Dylan and I shift over on March the 5th. Come and see if I am able to process any of Richard’s excellent advice…and if I’m able to remember all of his lines. “O, for a muse of…line?” “Think, when we talk of horses that you…line?” “Now entertain conjecture of a…line?” Haha! I kid. On a serious note, on behalf of the entire company of Henry V, we’re going to miss you, Richard. Thank you for everything. Richard Willis’ portrayal of Chorus was utterly fantastic. (I can’t wait to see what he does in Twelfth Night. High bar. 😉 ) Good luck, Louis! Thanks, Dawn! Yeah – I should’ve mentioned in the post that Richard and I will both be returning for “Twelfth Night,” Richard as Malvolio, and me as Feste. And I agree that Richard is fantastic – he will be missed. Cheers! Twelfth Night anticipation grows even higher! PS, I should have mentioned that I loved your Bardolph. Oh hell, this whole cast is superb. Oh, poor Dylan Myers … he’s got big shoes to fill! The expression on your face as you plead for your life is heartbreaking. Break a leg, Mr. Butelli! I’m curious — since you’ve know about Mr. Willis’ departure for a bit, does the cast rehearse both versions? Or do you just sort of jump in? Wow, thanks, Angelica! Dylan will be great. To your question: the whole understudy ensemble has been rehearsing in the day time. Eight actors (named in the post) are on “stand-by.” They don’t perform in the show, but they check in every night and come to watch periodically. Then five of us (also named above) are in the show, and also rehearse our understudy tracks. This Friday, I’ll get one “put-in” rehearsal with the company of H5, plus full tech. And then, on March 5th, I’ll pretty much just jump right in. Sort of exhilarating and terrifying all at once. Anyway, thanks for reading, and thanks for the kind words. Cheers!